PATH, a Seattle-based global health development organisation, is aiming to save two million lives by 2015 by jointly tackling diarrhoea and pneumonia, the leading killers of children globally. Steve Davis, president and CEO of PATH, delivered the message at the ninth annual PATH Breakfast for Global Health held in Seattle on Tuesday. “Today we placed a bold stake in the ground, with partners around the world, to save two million lives by the end of 2015,” Davis said. PATH will begin its efforts in India, Cambodia and Ethiopia, where intervention is most urgently needed and PATH has resources. While all three countries have seen their child mortality rates from diarrhoea drop, India’s pneumonia death rate remains stagnant, accounting for 24 percent of deaths of children under five, the same as in 2000, according to 2013 World Health Organisation statistics. “No parent should have to bury a child because of something we can help prevent or treat,” Davis said. Diarrhoea and pneumonia are two diseases that overwhelmingly affect children in African and Asian countries, Davis said, with diarrhoea claiming around 760,000 lives a year. And while the number of children dying in Africa before the age of five has decreased, it still vastly outnumbers all other parts of the world, according to the 2013 WHO statistics. Melinda Gates, philanthropist and founder of the Bill and Melinda Gates Foundation, which helps fund health development and vaccines world wide, spoke at the breakfast of the importance of vaccinating children as well as “appropriate” science that meets the needs of communities in the developing countries. “[The] developing world is littered with pilot programmes,” Gates said. As he took to the stage, Davis pointed to a tool belt around his suit jacket. A visual aid, the belt allowed Davis to show and carry some of the tools that can prevent the deaths of so many children from diarrhoeal disease, tools that will be used to achieve PATH’s life-saving goal. Clean water, soap, zinc tablets for oral rehydration therapy and the rotavirus vaccine, which stops some diarrhoeal diseases before they start, were all included. But it’s not just science and vaccines that can improve the lives of communities ravaged by diarrhoea. Deeply held cultural traditions and ideas about the disease have to be altered as well. Dr. Alfred Ochola, PATH’s Technical Advisor for Child Survival and Development in Kenya, spoke about educating Kenyans on how to reduce the risk of diarrhoea in their communities through hygiene practices like hand washing. But Ochola, who lost a brother and sister to a diarrhoea outbreak in Kenya as a child, has found that at first, people are reluctant to embrace change. “A big [challenge] is combating old beliefs that diarrhoea is a curse and not an infection, and that the death of a child is an inevitable part of life. ‘God will give you another one’ is a common saying in Kenya,” Ochola said. Many people believe a child who has diarrhoea is cursed, Ochola said. Vomiting and diarrhoea are welcomed because it rids the body of the evil inside it, while it should be taken as a sign that something is seriously wrong. Poverty is another challenge in combating the diseases. Although heart disease and diabetes are becoming the new illnesses of poverty, according to Davis, diarrhoea and pneumonia still adversely affect children of developing countries in Africa and Asia. In Africa and Southeast Asia, the percentage of child deaths are higher than the global average and have not significantly decreased in 10 years. 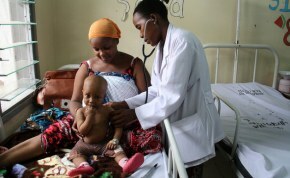 Both regions have seen child mortality from diarrhoea fall from 13 percent to 11 percent of deaths from 2000 to 2010, but in Africa, the rate of death from pneumonia has actually increased, from 16 percent to 17 percent. “Too many people lack the financial means to seek care when it’s most needed, like paying for transportation to get to a health facility far from home… We often reach women and their children too late,” Ochola said. Ochola told the story of Jane Wamalwa, a Kenyan woman who came to understand the reasons behind making a change in long-held practices in treating and preventing diarrhoea. Wamalwa lost three children to the disease, and has now become a trusted source of information on good anti-diarrhoea practice in her community, Ochola said. “It has become her calling,” he added. This entry was posted in Africa Healthcare, Child Deaths, Diarrhoea, PATH Seattle, Pneumonia and tagged Bill & Malinda Gates Foundation, Child Deaths, Disability Aid Abroad, International Disability NGO on May 25, 2013 by disabilityaidabroad.